L’eau The One and The One is a very good example of why you shouldn’t put so much weight into the popular notion that Eau de Parfum and Eau de Toilette smells the same, with EDP lasting longer and smelling stronger. True, that may sometimes be the case but as we’re going to see where with The One and its lighter friend, L’eau The One, that is not always true. In Bottle: Fruitier than The One to me, but the mandrin is still there. Despite this being fruitier, it is less sweet than the original making this a much nicer opening ride. Applied: Fruity opening with a more present note of mandarin but a stronger presence of lychee. The peach is less noticeable and falls off rather quickly. There is less cloying sweetness overall. The fragrance is still very feminine and very sweet but the sweetness has been toned down and the fragrance is doing better for it. The mid-stage is largely the same with less sweetness added in and a warm amber that’s more evident earlier on in the fragrance. The florals are still sweet but there’s a more tolerable cleanness to the scent now that helps L’eau The One be even more wearable than The One. The plum is a bit more tame in this fragrance, giving the fragrance a nice dry floral and fruity smell and without the heavy sweetness. The dry down sees a less prominent vanilla note while giving a green vetiver and woody note in the dry down some more showtime. The result is a woodsy green dry down after a semi-sweet creamy, fruity floral show. Extra: L’eau The One doesn’t seem to have an official set of notes so it shares the notes list for The One. Some people have noted the presence of an oak moss-like note in the dry down. To me, the dry down smells more like a mixture of vetiver and woods. Design: L’eau The One is designed in a very similar way to The One. The only discernible differences are the colors and the name of the fragrance. Where The One had a gold cap, L’eau rocks a silver cap. Where The One had black lettering, L’eau uses white. And where The One had a golden-yellow liquid, L’eau is more clear. Notes: Mandarin, bergamot, lychee, peach, jasmine, lily of the valley, white lily, plum, vetiver root, amber, musk, vanilla. L’eau The One was supposed to be a lighter, fruitier interpretation to The One. But tweak a few notes, dial down a couple, dial up a couple and you get something that smells decently different from the original. There is still enough in this fragrance to connect it to The One, but it is definitely a lighter, less sweet version. To me, the toned down sweetness makes this more wearable and I would pick L’eau over The One if I had a choice between the two. On an unrelated note, last year on this day in 2010, That Smell saw its first post. Hooray, we’re one year old! Reviewed in This Post: L’eau The One, 2009, Eau de Toilette. 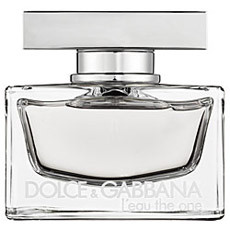 This entry was posted in dolce and gabbana, floral, fruity, Reviews By House and tagged amber, bergamot, jasmine, lily of the valley, lychee, mandarin, musk, peach, plum, vanilla, vetiver root, white lily. Bookmark the permalink.